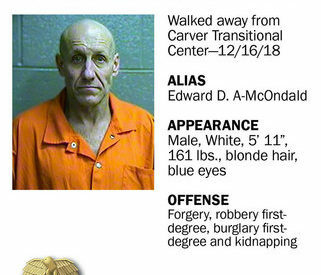 OKLAHOMA CITY — Chris E. McDonald walked away on Sunday from the Carver Transitional Center in Oklahoma City. McDonald, 49, is described as white, 5-feet 11-inches tall, weighing about 161 pounds, with blonde hair and blue eyes. His aliases include Edward D. A-Mc Onald and Edward D. McOndald. When he walked away, McDonald was serving a five-year sentence for forgery out of Oklahoma County.